Today I found out that the astronauts and cosmonauts on the International Space Station witness around 15 sunrises and 15 sunsets every day. A space sunset is said to be a spectacular sight that shows in vivid detail the many layers of the Earth’s thin atmosphere. The first layer displays the dark part of the Earth experiencing night. Above that, in deep orange and yellow is the Earth’s troposphere, which contains almost all of the clouds in the sky. Then the pink to white region above the clouds which gradually turn to a light blue band, essentially the stratosphere, which is that part of the Earth’s atmosphere where airplanes fly. The layer above the stratosphere appears as a darker blue band that gradually fades away into the cold dark vacuum of outer space. 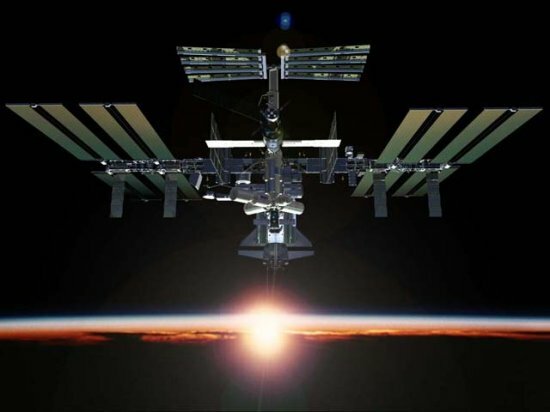 The in-orbit construction of the International Space Station (ISS) began in 1998 and is scheduled for completion by late 2011. The station is expected to remain in operation until at least 2015. The ISS is operated by Expedition crews of six astronauts and cosmonauts, with the station program mandating maintaining an uninterrupted human presence in space since the launch of Expedition 1 on October 31, 2000, a total of little over 10 years thus far. The International Space Station can be seen from Earth with the naked eye. Since 1998, the International Space Station’s orbit is inclined to the equator by 51.65°. At its most northerly, it is at the latitude of London, England, and at it most southerly, it is over the latitude of the Falkland Islands. More shooting stars can also be seen from the ISS than from a person standing on Earth. The primary reason being that the astronauts have a much wider view of the sky. The clock on the International Space Station ticks about 0.0000000014% slower than an earthbound clock because of relativistic effects. In 2014, the International Space Station is expected to receive the most accurate clock ever launched into space, which is a cesium clock. Due to the weightlessness of space, dust does not settle down, it just floats around. Because of this, astronauts aboard the ISS sneeze about 100 times a day! In April 2001, Dennis Tito became the first ever space tourist. He paid $22 million to stay aboard the ISS for eight days. The record for the longest single stay in space was broken by cosmonaut Valeri Poliakov after he stayed in space for 438 days, 17 hours, 58 minutes, and 16 seconds! Because of the relative speed of the Space Station, each sunrise or sunset aboard that vessel only lasts a few seconds.